Inclusive, modern and mellifluous, Manta Ray provides inclusive community delight for all ages and abilities. 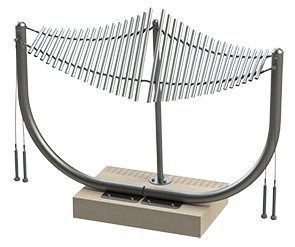 The beautiful winged, non-resonated metallophone features a total of 36 suspended anodized aluminum chimes designed to produce magical airy sounds in the tune of C major. 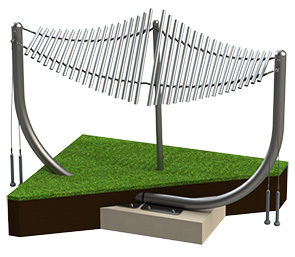 The distinctive chimes of the Manta Ray are fashioned to the frame with nylon coated stainless steel cable. 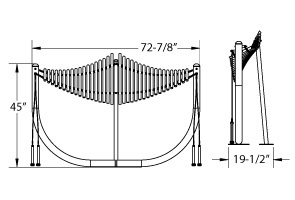 The powder-coated 'U' shaped frame delivers ample support with a center-upright that underpins and separates the mirrored twin chime assembly. 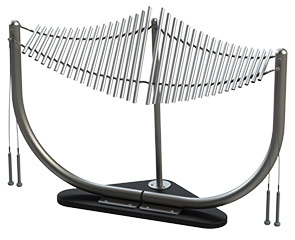 The artfully styled design of the Manta Ray accommodates solo and duet performances and is adeptly engineered to never produce any wrong notes. Two sets of mallets are included.